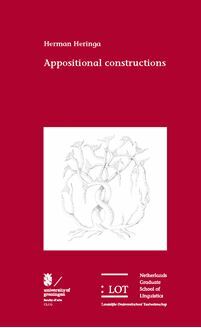 This thesis comprises a thorough investigation of appositional constructions from a formal linguistic perspective, based on cross-linguistic data. The key to a better understanding of these constructions is in studying the syntactic and semantic relationship between the two main components: the anchor inside the host clause and the apposition proper. This relation has a paradoxical character. On the one hand, an apposition is closely linked to its anchor in that they form a constituent together. On the other hand, the connection between the apposition and its host is loose in the sense that the apposition constitutes an independent proposition. It is argued that the semantics as well as certain morphological and prosodic aspects of the construction are reflected in, and in fact explained by, the syntax. Nominal appositions are predicational clauses in which a pronominal representative of the anchor functions as the subject, and the visible apposition as the predicate. The two main types of appositions, the attributive ones and the identificational ones, directly correspond to the major types of predication known to exist. Special attention is paid to case marking of appositions. It is demonstrated that predicative case on the apposition, case matching with the anchor, and mixed patterns occur in different languages and registers. This confirms the dual nature of the appositional construction. Furthermore, it is shown that the appositional ‘clause’ behaves as a parenthetical in many respects. The author proposes a specific theory concerning the attachment of parentheses to the host clause. This study is of interest to a general linguistic readership, and in particular to syntacticians and semanticists concerned with appositive constructions, parenthesis, predication, and case marking.